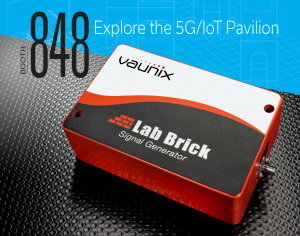 Newburyport, MA – June 2, 2017 - Vaunix, a leading developer of programmable wireless test devices, will be introducing their latest attenuators and signal generator in the 5G/IoT Pavilion at booth #848 at IMS 2017 in Honolulu, Hawaii, June 6th-8th. Capable of bidirectional fixed attenuation, swept attenuation ramps, and fading profiles, the Vaunix LDA-602Q 4 port programmable attenuator provides up to 120 dB of control range with a 0.1 dB step size from 200 MHz to 6 GHz. Each of 4 RF ports of this device has a 50 ohm impedance with VSWR less than 1.3:1. Fast switching speeds of 15 us can be expected. The LDA-602Q unit is compact, fitting into a single standard rack unit with well-spaced 50 ohm SMA female connectors for each RF port. Additionally, the only power and control connection is from a standard USB type-B female. Price is $2,900. The LDA-602EH attenuator has a large attenuation range of 120 dB with an exceptional 0.1 dB step size, allowing for both precision and accuracy during fading tests or device characterizations. This attenuator also features a fast 15 us switching speed, an operating temperature from -30°C to 50°C, a maximum RF input of +28 dBm, and is priced at $875. The LDA602-EH operates with a low insertion loss of 9 dB to 6 GHz, an input IP3 of +55 dBm and a typical VSWR of 1.3:1. 4-port programmable devices are coming soon. The LMS-183DX 6-18 GHz Signal Generator Offers up to 80 dB of power control range. This unit typically operates with a voltage stand wave ratio (VSWR) at 1:4:1 (2.0:1 maximum) and weighs less than one pound. Maximum harmonics are -25 dBc (-38 dBc typically) when the LMS-183DX is set to +10 dBm output power. The LMS-183DX is controlled and powered through USB with advanced features such as phase-continuous linear-frequency sweeping, internal/external 10 MHz reference, and optional pulse modulation. Price is $3,499. To answer any questions about a Lab Brick's durability watch this YouTube video where one gets dropped off a bridge at IMS 2016 into traffic.